Beautiful soft throw. So warm, no complaints . Enjoy plush comfort with this throw blanket. 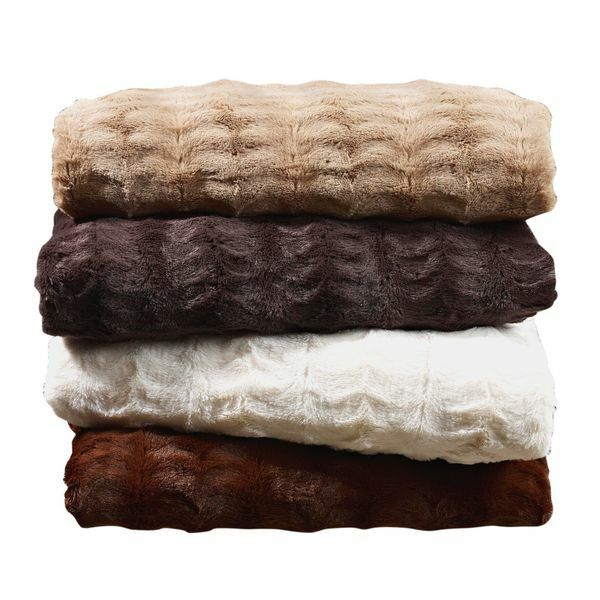 Featuring a faux mink fur top and smooth microfiber reverse, the blanket provides luxuriously cozy warmth and softness. The blanket features a subtle stripe pattern and is available in a range of neutral colors to complement your decor. If you're thinking about buying this blanket, don't hesitate.. Buy it! Washed and dried wonderfully, super soft and comfy, nice winter weight blanket and So Pretty too! Also, it does Not shed! This blanket is gorgeous and the feel so soft. I had originally bought this blanket as a gift, but after seeing it and feeling it I have decided to keep it for myself. I just received this beautiful, soft blanket yesterday and couldn’t be more pleased~! It is the softest blanket and oh so cuddly to cozy on the couch with for a good movie. It is made by Swift Home and is a twin size in cream. The blanket is polyester and machine washable, tumble dry. The top of this exquisitely soft blanket has a distinct pattern to its 1/4” fluff which is almost like a feathery swoosh complementary back and forth. The bottom is also extremely soft, also cream colored, and reminds me kind of a faux suede. The two fabrics are not seared together and are sewn around the edges. The blanket is not thick, but as a whole, has substantial weight to it given its size. It is also a warm and cozy blanket. I gave it 5-STARS as it is of very high quality and worth its weight in gold. Thank you~! I received my Faux mink blanket today-I ordered chocolate and can see how one reviewer perceived it as black and dark grey as from across the room it is quite dark but for me that means it will go well thrown over either my dark brown recliner in the sitting room or my black recliner in the living room. It is almost a medium weight blanket, very soft and pretty-it is a good sized Full blanket and I like it very much, my intent is to use it as a throw in my bedroom across the foot of the bed once my new Laura Ashley rose quilt arrives from Overstock. I just ordered this last week and am across country from where they shipped from, so it got her in good time as well. Both sides are soft with the striped texture on the front and more solid color on the back. This is a large plush throw blanket. Super soft and excellent quality. I got the carmel color. It is a rich color. I would recommend this product to anyone. 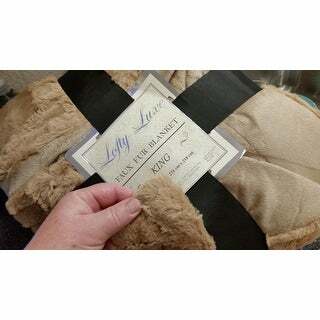 Super soft but breathable faux fur blanket .Has very elegant but subtle textural pattern .Loved it so much that the first thing I did when we replaced our Queen bed with a King was order a new King sized blanket to use as a bedspread. It is heavy enough for coolest nights we experience here in Vegas but it is not too heavy to use during summer months with a/c on. It washes well. I have used warm setting and dried it on low temp. in commercial laundromat at least 2x month for past year without any issues. Great value. Very warm and soft. A great blanket for wrapping up in on the couch to watch TV or put on the bed. Very elegant looking. The faux fur pic is VERY deceptive, only actually about 1/4 inch long, and King size barely gets to the ends of the mattress. I bought the cream faux fur throw blanket and I love it! It's super soft and looks divine on my bed. The pattern looks like real fur while in fur-friendly way. The feel off the blanket is luxurious, but it is to thin, I still love it. It is nice and warm. I have had it for about a year now and have no complaints. Mine, don't touch my super soft blanket! I absolutely love this blanket. It is soft as butter!! Feels wonderful against your skin and can't keep my pomeranians off it! If you need a cuddle this is for you!!!! Love it!!! I just received this blanket. It looks and feels very nice, but the Tan looks just like the Caramel photo. Looked warm brown online. I really don't want the hassle of returning it, Very disappointing. Might try again with another color selection. I love these throws. Super soft and cozy. Wash up perfectly. Beautiful, works well with bedroom linens. Soft and cozy. It was very soft & exactly what I expected it to be,i love it & so does my girlfriend. This Queen Size blanket has been wonderful...we have washed it and dried it a lot. We have dogs and they sleep with us. I am planning to buy another one...we are getting a king size mattress so I will need a bigger one. Very soft. We like it very much. These blankets are amazingly soft and super cozy!. I purchased 2 for my husband and myself then ended up buying another for my very picky mother for Christmas, she loved it!. They are machine washable but you should hang dry them if you want to keep them as soft as when you first purchased it. I would definitely buy again. Very soft and comfortable Very large and luxe. We use it as a sofa blanket. Looks great on our couch. Looks expensive and has held up well so far. This is so soft and the exact color and size I wanted. So far so good I love it. "Is the cream color look yellow or more white?" It a very pretty cream/white top blanket. Not heavy, the design is so nice I like to show it. It looks more white. It's very pretty. "what is the size of queen?" "what are the dimensions of the twin size mink blanket"
Twin measures 66"W x 86"L.
"How heavy is the queen sized blanket?" Hello dab2d, the shipping weight, of the queen size Luxe Double-sided Faux Mink Blanket, is approximately five pounds. Have a great day. Love fur on my skin.